That was the different epoch. I was doing my management. 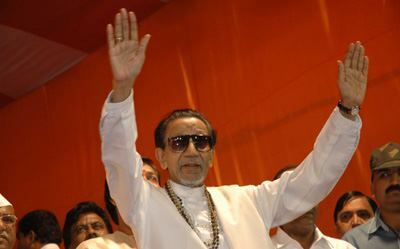 At evening, Balasaheb Thackeray was supposed to address the election rally at Golf Ground at Nashik. I have seen how people were mad to listen him. People from whole district travelled voluntarily to listen him. I along with my friends was also curious to see him and listen his speech. That experience was mind blowing. I realized that day, how one person can influence the mob. It was surprising to see people from all the social strata seating together. In the mob, there were students, doctors, lawyers, professors, teachers irrespective of their political affiliations and interest. When I joined Semperit Group and started to handle the Roha plant of Sempertrans Nirlon Ltd., the JV with Nirlon Ltd., I started to deal with the union, Bharatiya Kamgar Sena (BKS), affiliated to Shiv Sena. We had to visit Sena Bhavan at Dadar frequently to discuss issues with Union office bearers, the then President, Ramakant More and the then General Secretary Krishnakant Kondalekar and afterwards their successor, Suryakant Mahadik and Kiran Pawaskar. (Kiran left Shiv Sena and is now MLC of NCP). Once I, along with our Plant Head, COO and local union committee members went there to discuss the long pending bonus issue. We were waiting for the meeting and discussing with Albert Pinto, the secretory and our plant union in charge from BKS. Suddenly everybody started to move. We understand that Balasaheb was coming at the Sena Bhavan. The whole building suddenly woke up. I sensed different energy in that building that day. While walking towards his office, he just saw us, we greeted him, he smiled, waived his hands. Albert introduced us with him. When he understood that we were from Sempertrans Nirlon, the JV between Semperit and Nirlon, he enquired about the JV and financials. Balasaheb had a soft corner about Nirlon Ltd as it was among first few units where BKS started their unions in 1970s. “Fight for the right, but don’t close the plant.” He used to say to workers. My reaction was, he came, he saw and he conquered. It was hardly 2-3 minutes conversation, but his persona, his style influenced me and my team members. When he visited Roha for rally, he chose our Guest House for the short stay. People loved him and made him icon, larger-than-life, in politics. He was the mascot of Marathi pride. Balasaheb Thackeray always was a God to common Sena workers. He was the example of tough but popular leader. He was the great cartoonist, with generous humor. He was the only fiery orator, who could bring Mumbai and Maharashtra to a standstill with a wave of his finger. What makes him a great, charismatic and most influential leader? 1) Kingmaker instead of being a King: Balasaheb never contested any elections. He never dreamt to become Chief Minister, Prime Minister or never projected himself as a candidate for any position. When Sena-BJP alliance came into the power in 1995, he chose Manohar Joshi as Chief Minister. This was unusual in the history of India. Even, it was possible for him to crown his son Uddhav as Chief Minister, he chose Manohar Joshi. People admired his gesture. 2) People Connect: I personally experienced this when I attended his rally or even his short 2 minutes gesture. He spoke what people wanted. This does not mean that he was luring people. Through his gesture, body language and speech, he used to connect with the people easily. He ensured self-reliance among people. He was advocate of new things. The Pune-Mumbai Express highway, flyovers in Mumbai and infrastructure development was his idea and he did that. 3) Unconventional Views: He was known as much for his unconventional views. He never fought shy of expressing that views, sometimes contradictory to political philosophy of alliance. He supported Prathibha Patil and Pranab Mukharjee during presidential elections. He also supported his political rivals when it came to something good. He admired Hitler for his art and leadership qualities. 4) Talent Management: Yesterday, one Shakha Pramukh (In charge of a ward in the city) was interviewed by news channel. He was a waiter, got opportunity to work with the party and was entrusted the responsibility of the ward. He said that this is possible only in Shiv-Sena. And this is true. Though he was the remote control for the government, he gave the opportunity to all people. Maharashtra witnessed, the first Bramhin Chief Minister, Manohar Joshi, OBC leader Chagan Bhujbal was the first Mayor (from Sena) of Mumbai Municipal Corporation and first Leader of Opposition of Legislative Assembly. He developed leaders at all social strata and delegated responsibilities. He aligned them towards one political goal. 5) Charisma: He had a Magnetic persona. Very few people have this. He had built his image with lot of thought. Being a cartoonist he had a great sense of humor. He always used this humor in his speeches. His voice was authoritative. There are many magical ways to express with voice. This is required to command and Balasaheb commanded his party workers with this authoritative voice. 6) Leader, organizer, team builder etc etc. : Shiv Sena is the success. This party has an influence over the Maharashtra politics and nobody can ignore them. This is not possible without leadership qualities. Balasaheb Thackeray was the tiger, warrior, he roared, he fought and he ruled over heart of millions. Do you know these types of people?